My Mom always called this her Mexican salad dressing. a favourite with the family. I'd forgotten about it until my daughter in law served it to us a few weeks ago. I mixed up a batch and we've been enjoying it again. It's wonderful on any green salad - especially those with fresh fruit added. 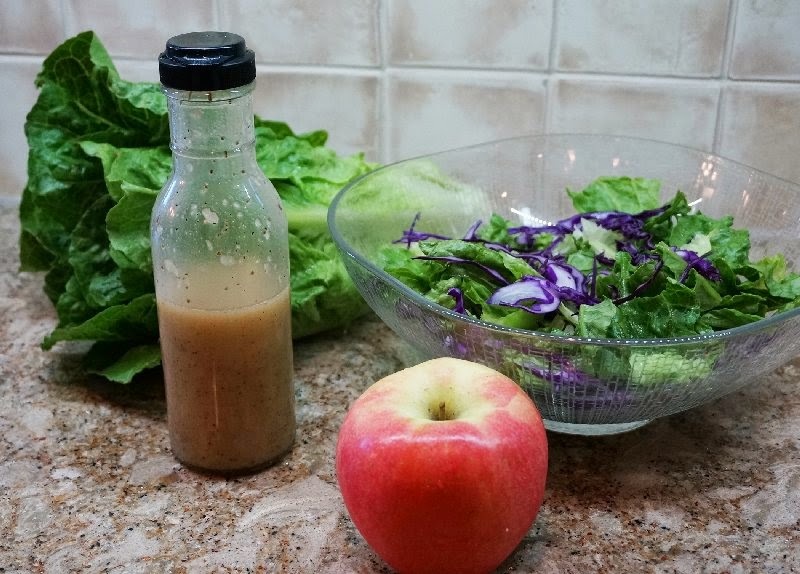 Combine all ingredients in a bottle with a tight lid. Store extra dressing in the refrigerator. It will keep for several weeks. Have you tried different vinegars ever? I am guessing that when you just put vinegar, you must mean regular white vinegar? I haven't used that in years for a salad dressing. For me, it doesn't matter what vinegar you use - I've used red wine, white, apple cider, balsamic. I don't know if you can spoil this dressing! It's been my Go-To when I don't feel like making Ranch or Bleu Cheese dressings. And for the onion question - (my opinion again) you can't use too much onion unless, maybe, you want to drink it straight from the jar! We want to taste onion in our salads, and this one is perfect - in all ingredients. This looks great. What about the oil though, can you use canola oil, or olive oil? one whole onion??? It seems like a lot. I'm always trying to find a better salad dressing so I think I will try it though. You guys rarely steer us wrong! 1. I have used white wine vinegar but the recipe calls for plain white vinegar. By all means experiment with the flavored vinegars. 2. I used canola oil but again, try olive oil or even Avocado oil. 3. I used a small to medium sized onion and grated it rather than chopping it. But use less if you prefer. A you can tell, this recipe lends itself to variation. This sounds real good to me. I will be giving it a try. I got this recipe from my daughter who got it out of an Amish cook book….It is delicious! The recipe calls for apple cider vinegar and 2 tsp lemon juice and 1 cup oil. I changed it up a little to make it a little less calories per serving…I did 1/2 cup olive oil, 1/2 cup water and instead of sugar used 1/3 to 1/2 c honey. Still delicious! So funny that she called it a Mexican recipe, I didn't really see anything that would make you think that, but it sounds great. I will probably try it with xyitol and Olive oil. I think that much onion will make it really wonderful. I love recipes like this!! I will definitely make this. Thanks Bev! I made this tonight and LOVED it!! My, oh my! I used red wine vinegar, grapeseed oil and celery salt in place of salt and celery seed. Thank you very much! !